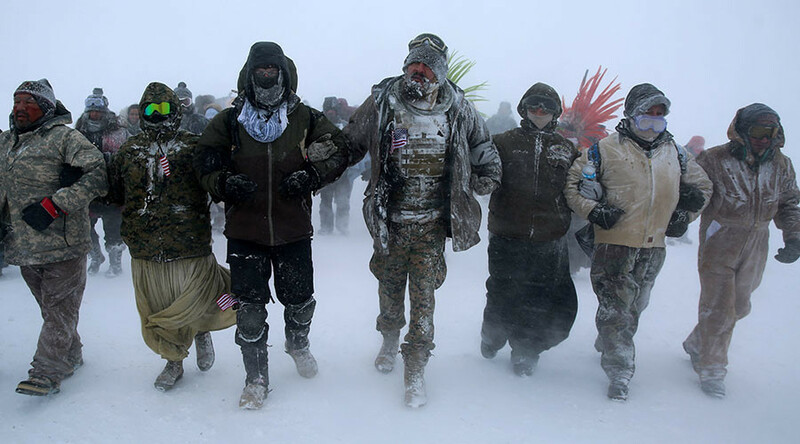 US veterans are returning to Standing Rock to support and protect Native American protesters as the Dakota Access Pipeline continues to meet resistance despite President Trump’s executive order to continue construction of the $3.7 billion pipeline. The veterans are gathering in Cannon Ball, North Dakota, with many on their way. The Standing Rock Sioux Tribe has vowed to fight the president’s order to push ahead with the pipeline despite the US Army Corps of Engineers stating it would cancel its planned environmental impact study and grant a permit for construction of the final phase of the pipeline beneath Lake Oahe to go ahead. The protest camps are being prepared for flooding that is expected to come as temperatures increase. The veterans’ presence will present a challenge to law enforcement wishing to remove water protectors from the area. Previous clashes between security officials and protesters have been violent, with police deploying water cannons, rubber bullets and teargas at protesters. Private contractors also set dogs on the demonstrators. The Veterans Stand group is fundraising for the protesters who continue to resist the pipeline being built by Energy Transfer Partners, and has raised close over $220,000 so far. It said the increase in “turmoil and uncertainty” at Standing Rock has inspired them to act. More than 1,000 veterans came to Standing Rock in December. Whilst there, they apologized to Native Americans for the US government’s treatment of the country’s indigenous people. Veterans Stand doesn’t expect the same veteran presence as before, but it will provide support to the camps through its fundraising. "The biggest misconception is that Veterans Stand wants to do anything aggressive in response,” Veterans Stand founder Michael Wood Jr told CNN. “People want to do something and they just don't know what to do. We just want to give people a platform." “Finally, it’s the US military coming on to Sioux land to help, for the first time in history, instead of coming on to Sioux land to kill natives,” veteran Dan Luker said.